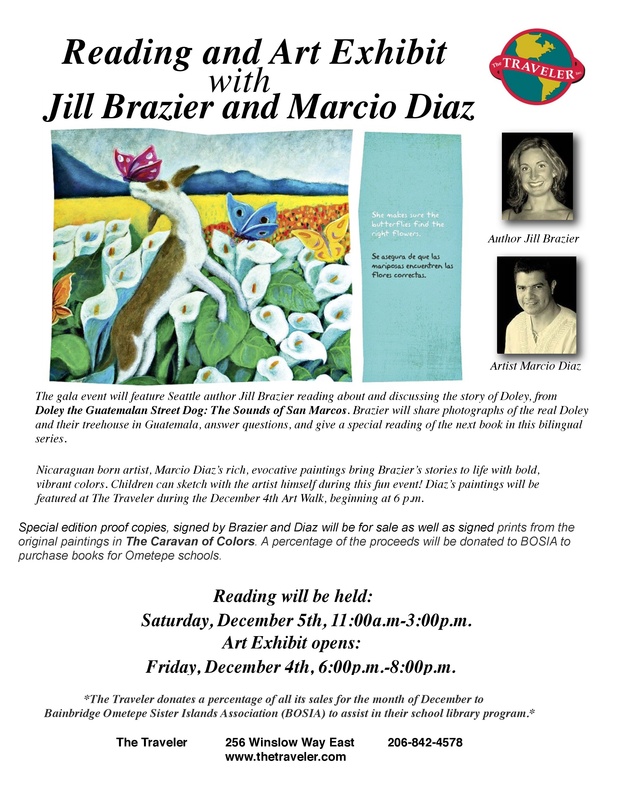 Doley, the Guatemalan street dog, is the star of Jill Brazier’s bilingual English-Spanish book of the same name, which features colorful vibrant illustrations by renowned Nicaraguan artist, Marcio Diaz. Both author and artist will be featured at The Traveler December 5th. In this podcast, Barbara Tolliver, co-owner of Bainbridge Island’s popular travel store, tells BCB host, Channie Peters, about this fun community event. 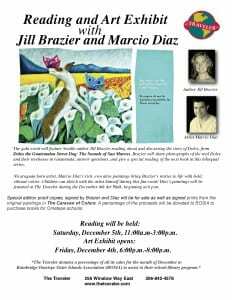 From 11 – 3 pm on Saturday, December 5th, author Jill Brazier will read from her heart-warming children’s book as well as from the next colorful book in her series, and artist Marcio Diaz will be doing some drawing with kids and all interested shoppers. This event will kick off this year’s charitable giving by The Traveler, which has a 20-year tradition of donating 5% of gross sales in the month of December to benefit Ometepe, our sister island in Nicaragua. Donations go to buy books for the school and community libraries in Nicaragua. Marcio Diaz’s art will be on exhibit during the Friday December 4 Art Walk, from 5-8 pm, and throughout the weekend. He, too, will be donating proceeds from the sales of his art to Ometepe. So do stop by the Traveler, both at the Art Walk on Friday December 4th and on Saturday December 5th from 11 am – 3 pm, to view these richly colorful paintings of Nicaragua by Marcio Diaz and to meet author Jill Brazier. Credits: BCB host: Channie Peters; audio editor: Tim Bird; BCB social media publishers: Chris and Diane Walker.